A house is so much more than just a building when it’s capable of controlling our emotions – something that Victoria and her fiancé, Ben, found when they stepped into their renovated kitchen for the first time. Find out how they did it, then browse more amazing real home transformations and find out all you need to know about redesigning your kitchen. 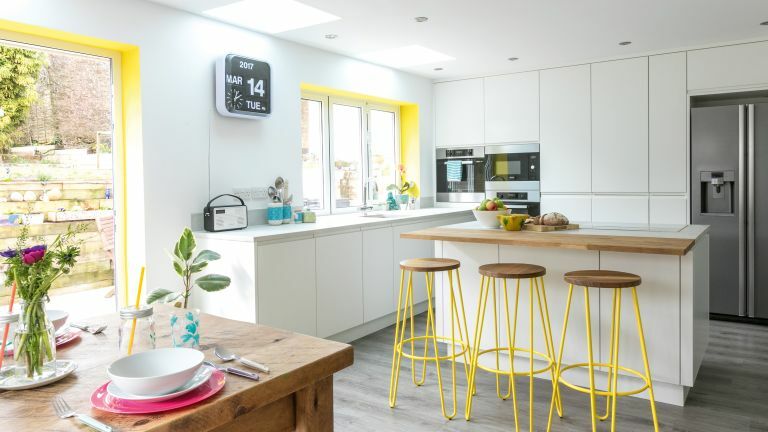 With help from extensive glazing and a clever use of colour, the couple have managed to transform a previously gloomy kitchen into a light and airy family space that they love to spend time in. ‘We moved to this house from a much smaller property in Farnham, but despite the fact that the new kitchen was bigger, it had dark fittings, black granite surfaces and small cottage windows, which made it feel really oppressive,’ Victoria says. ‘I felt so miserable being there. It was a strange layout, too, with an L-shaped work space that left a vast dead area in the middle of the kitchen. ‘Thanks to our experience working with a property maintenance company, we were able to project manage the build, and Ben got stuck into some of the structural work. We were very much involved in the project every step of the way. And because we had contacts in the industry, we were able to use local suppliers and contractors we trusted. ‘We sold off the original kitchen on Gumtree to generate revenue – although it wasn’t to our personal tastes, we knew it had quite a bit of value, and we were committed to being savvy and finding a bargain. ‘Our first priority was to bring as much light into the space as possible, so we replaced the small windows with white-framed bi-fold windows over the sink, bi-fold doors out onto the patio and three skylights running the length of the kitchen. 'I was tempted by the black frames that everyone seemed to be having, but white was the best choice in terms of keeping the space as bright as possible. ‘I’d heard that gloss white has a tendency to show every fingerprint and mark – a big no-no when you’ve got young kids – so we chose handleless matt white units instead. fitted ourselves after it had been cut, filled and sanded to our spec. It’s incredibly hardwearing. We had a big party for my birthday and there were some red wine marks left on the countertop; we sanded them off gently and they looked as good as new. the living room in that time, but we are delighted with the result. It’s the perfect space to entertain – I can prepare meals and still be involved in conversations. 'Our family love to visit, especially over the summer when we can open up the bi-fold doors. That’s when our indoor-outdoor breakfast bar comes into play.